Powerball was launched in 1992. Nowadays, it’s seen as the US most popular lottery. The jackpot never falls below USD 40 million. Fill out the ticket (play slip), match all numbers and the winning is yours! Step 1: Select five numbers from 1 to 69. Step 2: Choose one Powerball number from 1 to 26. You can choose your numbers or let the lottery terminal randomly pick the numbers for you „Quick Pick“. If you want to play more take the same steps and play the same set of numbers in multiple drawings. Select the number of consecutive drawings and days in the week on which you wish to play. This is called MultiDraw or Advance play. Finally, don’t forget to tick whether you want to play a supplementary game called Powerplay which can multiply your winning up to ten times. Powerball drawings are held in Florida’s capital, Tallahassee each Wednesday and Saturday at 10:59 (EST). Sales cut-off times are from one to two hours before the draw. If you play online the times may vary. Check first with your internet lottery provider when exactly the drawing takes place. One line of Powerball costs USD 2, in case of Powerplay add one more dollar for each line. Powerplay will multiply your winning. At the end of each drawing a certified system draws a Powerplay number showing the multiple of your win. The multipliers include 2x, 3x, 4x a 5x up to 10x! The 10x multiplier will be activated in the case the jackpot is lower than USD 150 million. This add-on feature costs USD 1 and must be chosen and paid for when buying the ticket. If you decide to play Powerplay you surely want to know what chances you have to win the maximum. Below you can find tables showing your odds with individual multipliers. The jackpot does not have a fixed maximum. It means that it grows until somebody matches all numbers. The growing jackpot is among players referred to as „jackpot rollover“ (see more in our article). If somebody matches all numbers he or she becomes a winner and the Grand prize gets back to USD $40 million. If you play Powerball you can become a millionaire but also contribute to good causes. Of each dollar spent on a ticket, 35% goes to good causes determined by lottery organisations representing individual US states. Powerball play slips may vary depending on the place where you play, online or with a retailer. Filling out a ticket online is faster and saves you plenty of time (our article about all advantages of online betting). On the other hand, there are people who would never play without holding a piece of paper in their hand giving them a kind of certainty of having something real, tangible. 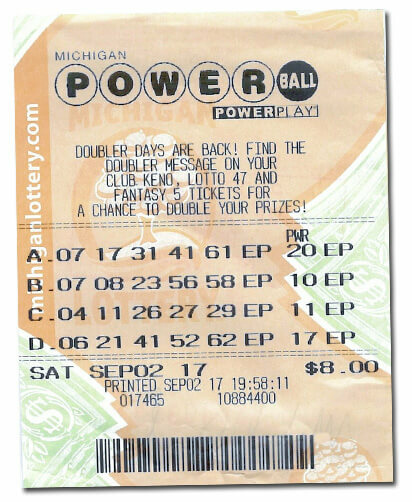 The ticket (play slip) is available from all retailers offering the Powerball lottery. Although the pay slips may vary depending on the state in which you play, the overall structure remains the same. Choose whether you want to participate in more than one game (Multidraw). Choose whether you want to play a supplementary game called Powerplay. Or, go for the Quick pick! Pay for the ticket and you are in! 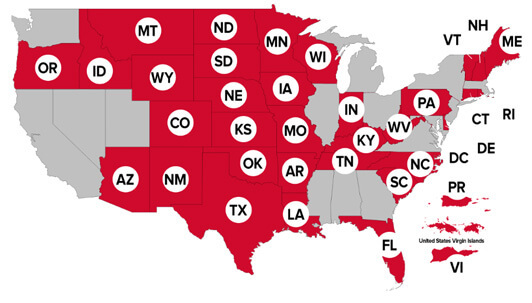 You can play with any retailer in any of 43 US states, the District of Columbia, and the U.S. Virgin Islands. To find a retailer is easy since they are placed in every corner. Look primarily for drugstores, gas stations, and grocery stores. Depending on the state’s jurisdiction you can play in some states online. If you are not a US resident you can play via online retailers. In order to raise your comfort and safety of game, we have tested online lotteries and based on the outcome wrote detailed reviews with illustrations. A complete list of tested, safe and recommended companies is displayed below. If you are a lucky winner you must not hesitate and within the next 90 days claim your prize. The expiry date is displayed on the back of pay slip. Don’t forget to take your winning ticket with you. All pay slips must be claimed in the same state in which they were sold. The actual collection depends on the height of the prize. Below USD 600: You can collect the prize from any retailer in the state where you bought the ticket. Just show your pay slip and you will be paid. Above USD 600: Amounts exceeding 600 US dollars can be collected at selected lottery offices or at the head office. Winners of big jackpots are advised to get in touch with the Powerball info line to arrange the collection of their prize. If you win the main prize called Grand prize we will send you congratulations and with joy point to our article with a detailed description of steps each winner should take. The article was written based on advice given by a well-known lawyer, Jason Kurland. All winners may choose the way of how they would like to be paid. There are two options. Option one enables the winner to have the prize paid out in 30 periodic instalments – annuities – spread over 29 years. Option two means that the winner receives the prize as a lump-sum. You have 60 days to make the decision. If you choose the annuity option your total prize will be spread over the period of 29 years and paid out in 30 amounts. Because of the inflation, you will get additional 5% per year. This option is preferred by the vast majority of lottery winners. The history of this game offers many sad examples of a winner going bust after squandering all cash within a few days. The lump sum option means a one-time lump sum payment that is equal to all the cash in the jackpot prize pool. From the winning you must deduct 25% of federal tax plus some state tax, varying based on the state’s jurisdiction. The first Powerball drawing on 22 April 22, 1992 had 15 participating US states. The Grand prize started at USD 2 million. Players were choosing 5 main numbers from 1 to 45 plus one supplementary number from 1 to 45. This format was in use from 1992 to 1997, when the jackpot was increased to USD 10 million and the format changed to 5/49 + 1/42. In 2001, an optional multiplier, called Powerplay, was added. A year later, the format was changed again (5/53 + 1/42). In 2005, the jackpot was increased to USD 15 million and the format was changed (5/55 + 1/42). This was followed by next increase in 2010 to USD 20 million) and next changing of format (5/59 + 1/39). In 2012, the drawings moved to Tallahassee and the minimum jackpot rose to the current amount of USD 40 million. In 2015 the 10x Powerplay multiplier was introduced for drawings with a jackpot under $150 million. The next year produced historical jackpot worth USD 1.586 billion. A detailed history with a timeline is contained in our article Powerball detailed history.